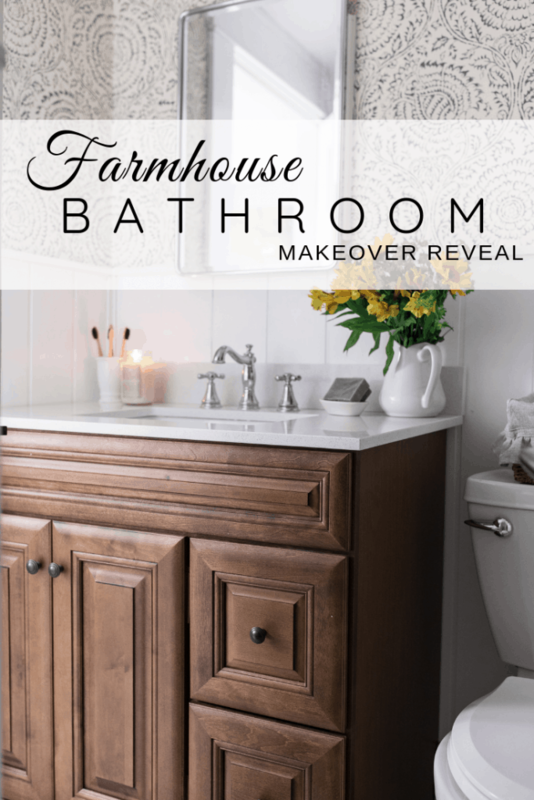 Our modern farmhouse style bathroom makeover is finally finished. 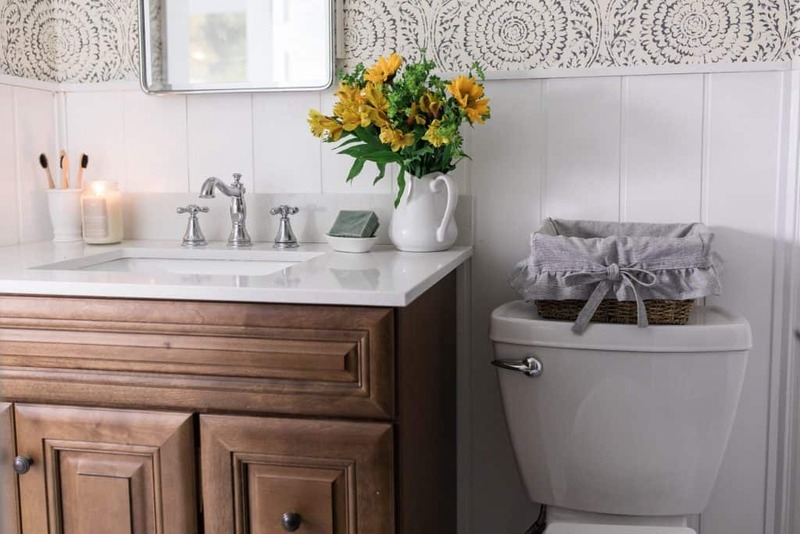 The color palette is neutral, with wood tones, gray white and a touch of blue. We added in chrome finishes for a stylish updated look. Don’t you just love it when your vision comes together?! 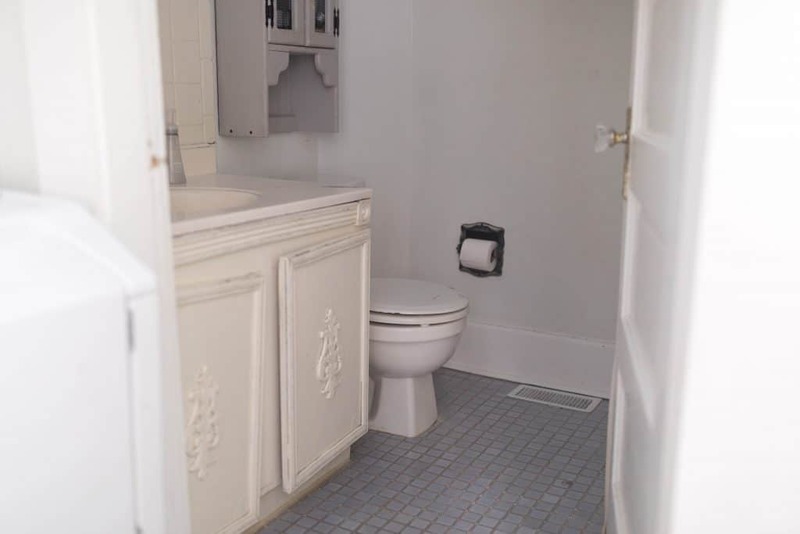 We basically stuck with the original plans for this bathroom makeover to a tee. 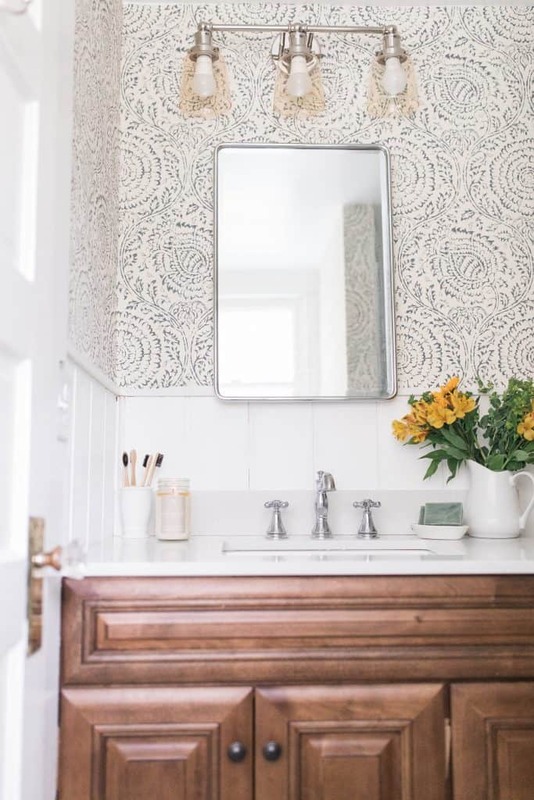 Other than switching up the mirror choice for the medicine cabinet, what you see above is what we brought into this space. You can get up to speed on the design plans in this post I wrote about the makeover. (Think shiny, new elevated style and modern, but with some old home character thrown in!) 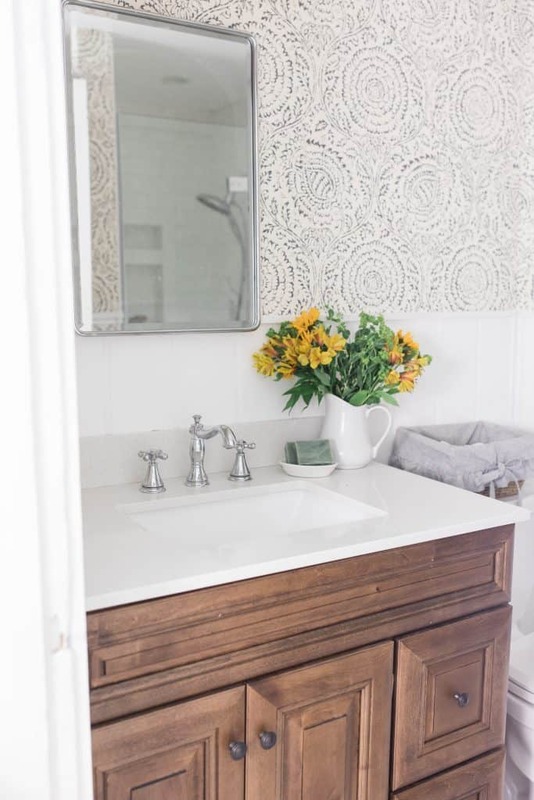 We went through the whole process of renovating our master bathroom a year ago, and finally worked up the courage to tackle the guest bathroom in our home. 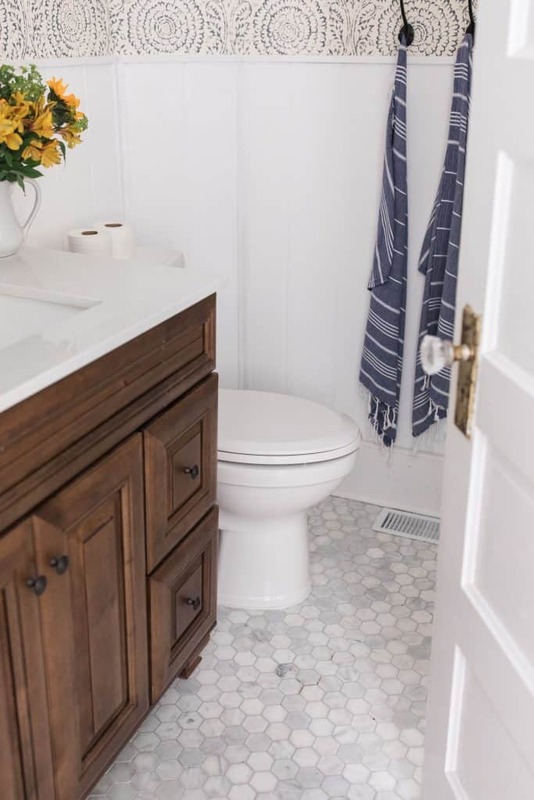 It’s not easy living in a house with five kids, and an unusable bathroom during a renovation, but the end result is so worth it. Sometimes the scale, and colors, of the items I select look different in person than in the online photos, but I was pleased with the way all the elements from my design board came together. 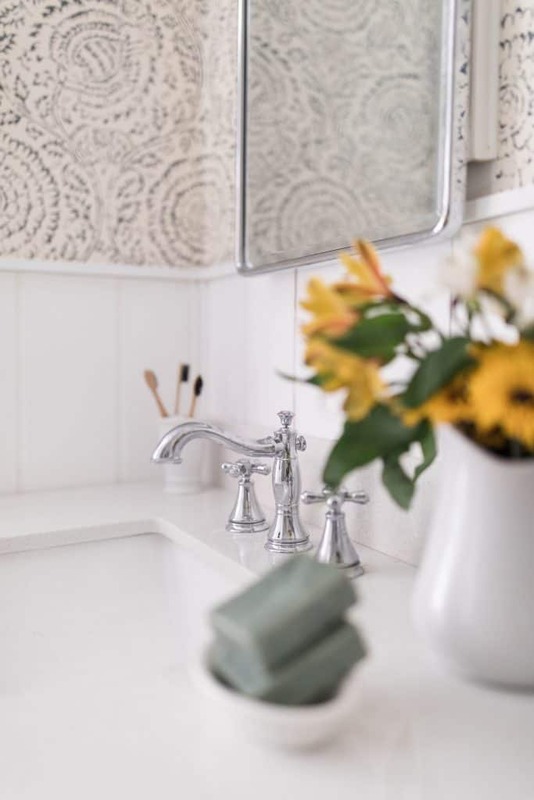 The Chrome finish on the faucet I chose from the Cassidy® Collection by Delta looks modern and stylish next to the marble hexagon, modern wallpaper and wood vanity. It brings a polished and elevated design to the updated space. 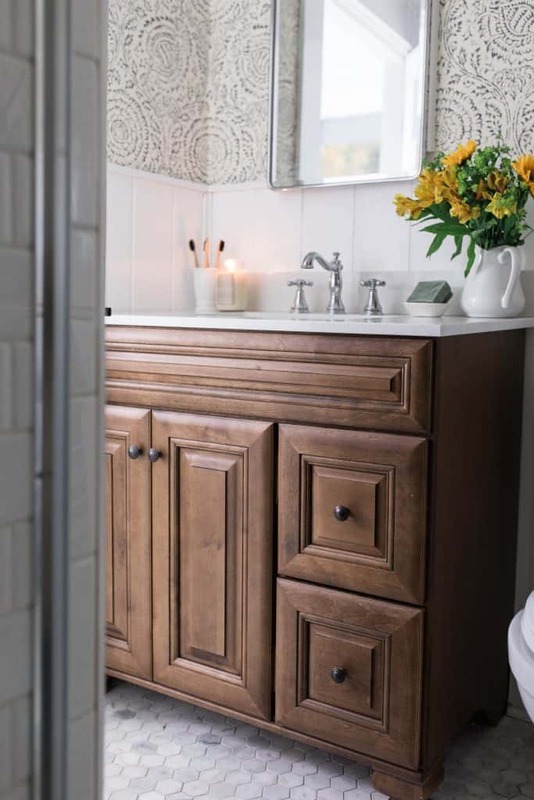 Although the house is almost 100 years old, I wanted this makeover to bring in modern design, while still honoring the character of our craftsmen farmhouse. I chose a classic subway tile for the shower walls and a tiled-in soap niche. 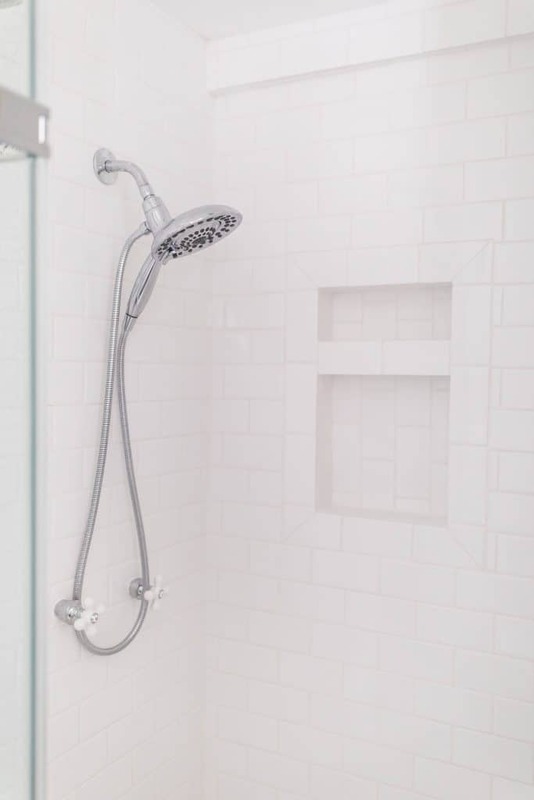 I brought in the Delta® In2ition Two-in-One Shower Head to add a little luxury to the bathroom makeover. 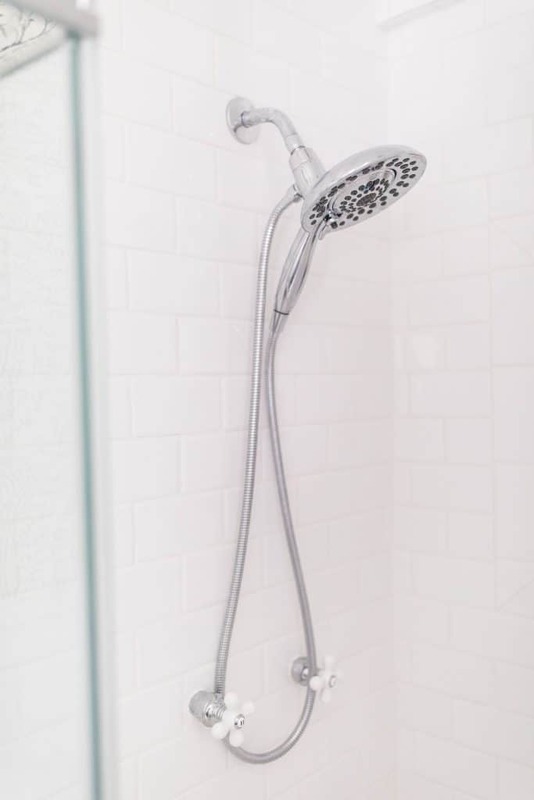 I can’t tell you how excited my husband is to take showers in this bathroom again, instead of trying to fit in the clawfoot tub I just had to have in our last renovation. While the walls were open, we also decided to wire in some lighting for the shower. Deciding to add in lights helped the space feel more luxurious and modern. For the shower door, we went with a sleek glass. I want to show off that shiny new Chrome shower head, soap niche and gorgeous tile. There was no way, I was going to hide all that behind a curtain! 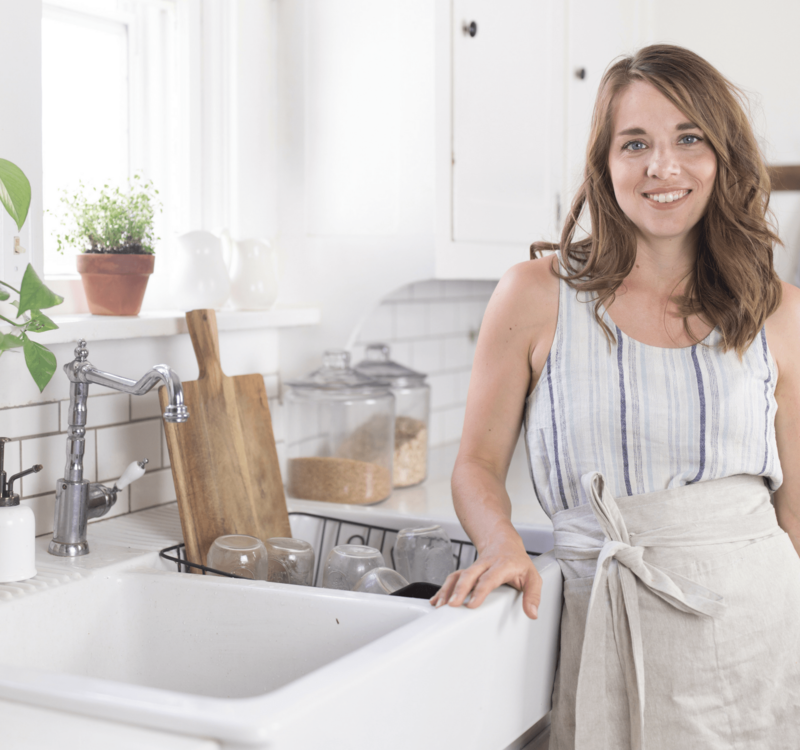 For this particular renovation, we decided to call in the experts to help get things started. We hired a plumber to set the new shower base. The previous one installed in this space was so stained up from 30+ years of use, that I didn’t think it would ever shine in the way that I wanted it to for this makeover. We also hired some tile experts for the floor and shower. 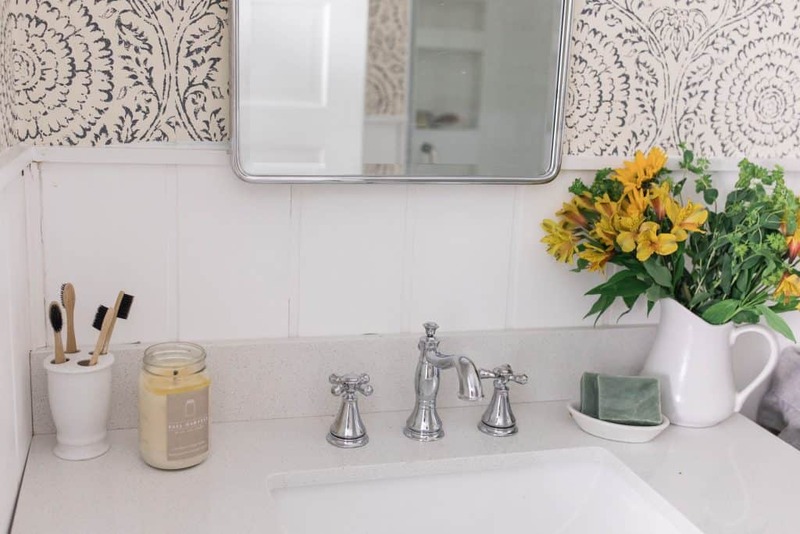 I opted to go with a tiled in soap niche, which is a bit of a custom design element, so I wanted to leave this to the professionals. 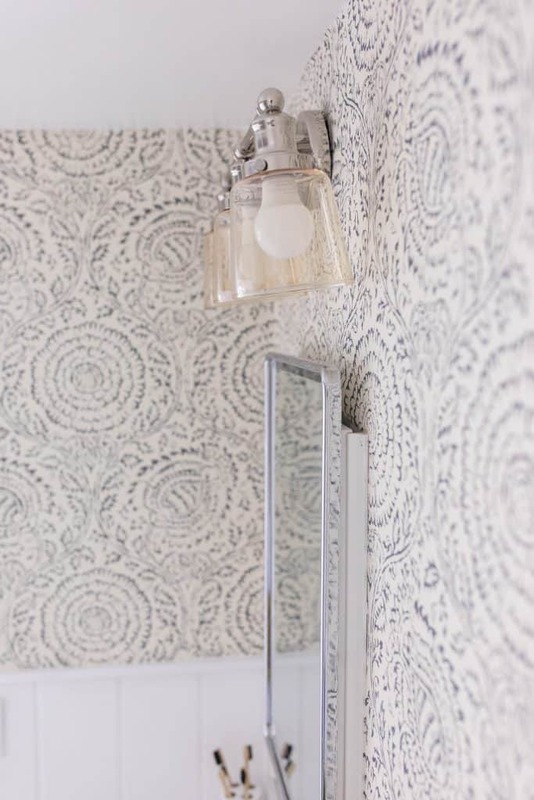 We DIY’ed the wallpaper, paint and glass shower door installation. I also brought the plumber back to install the Cassidy® Widespread Faucet and the Delta® In2ition Two-in-One Shower Head. 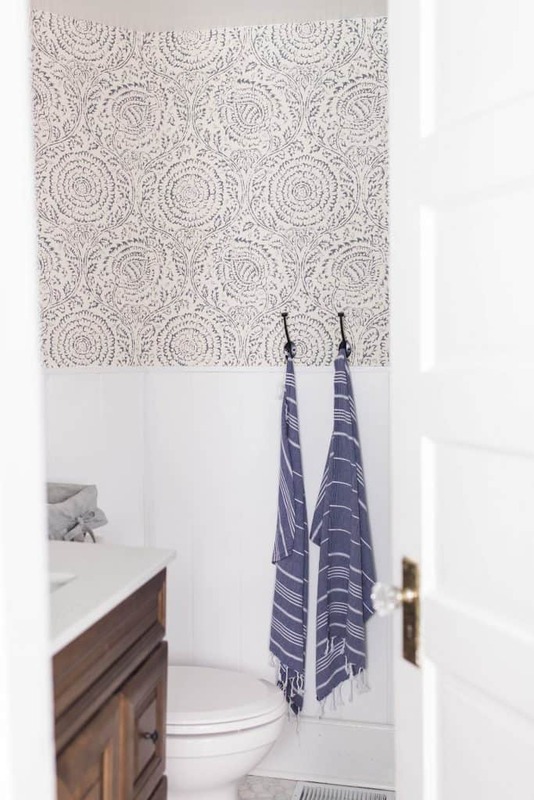 To add a little color, I brought in navy blue Turkish towels and added little black hooks to the walls. I also brought in a wicker basket with a DIY basket liner to store toilet paper on the back of the toilet. 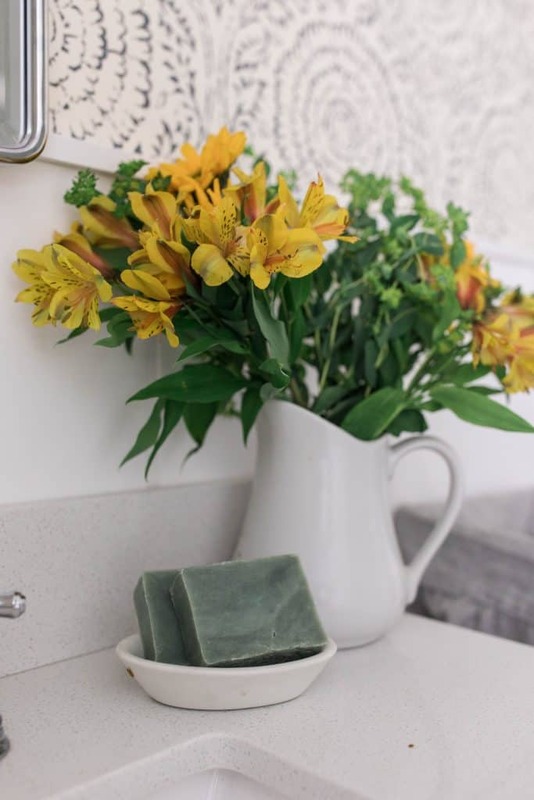 Fresh flowers, handmade soap and a cozy candle helped round out my modern farmhouse bathroom design. 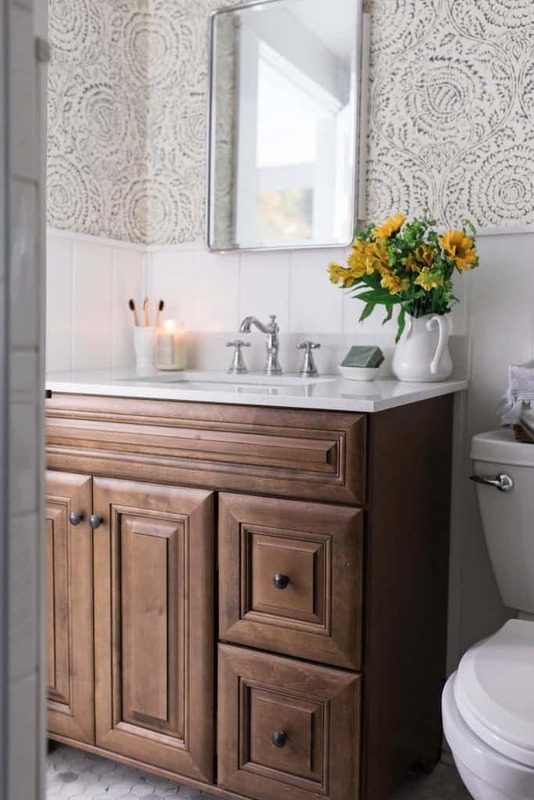 Get all of the before pictures, original design plans and the rest of the story on our farmhouse guest bathroom in this post. What an improvement, wouldn’t you say?! The goal was character, charm and elevated design. 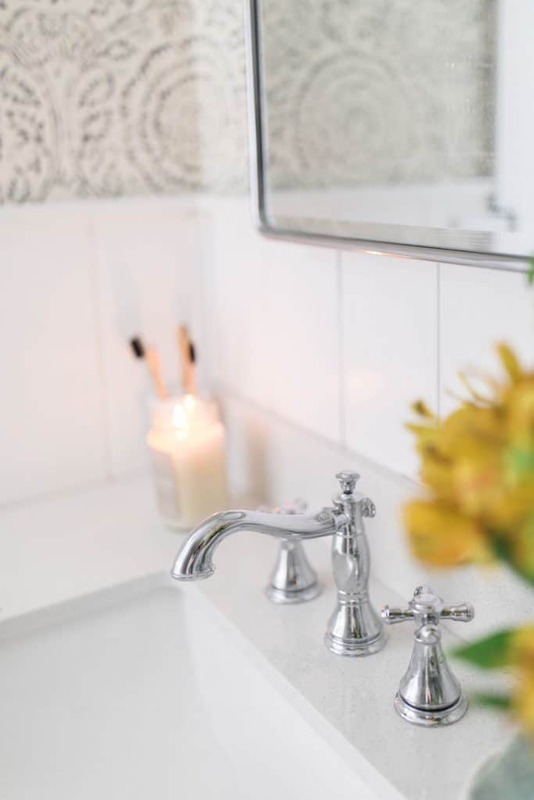 I think this makeover, with the help of the sleek and stylish faucets from Delta, definitely achieved that! Can you please share where you got the wallpaper? I love it !! Thank you. 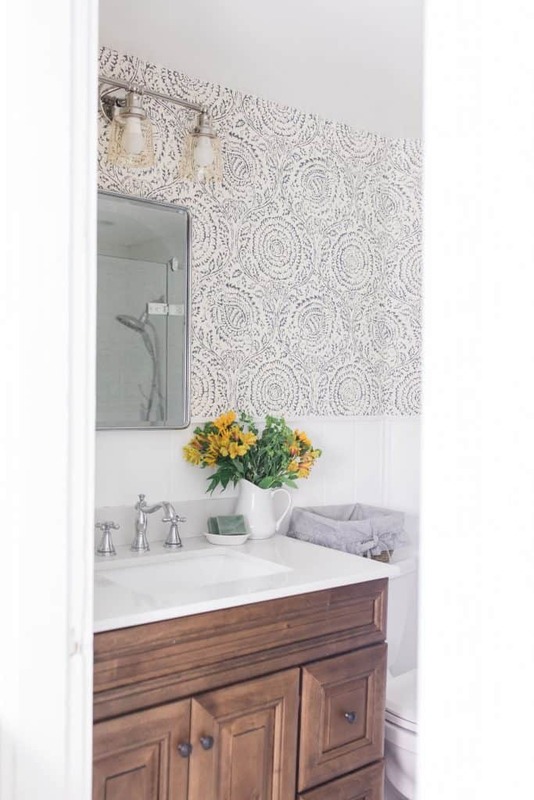 Love this makeover inspiration! May I ask the source for the medicine cabinet mirror? Thank you! 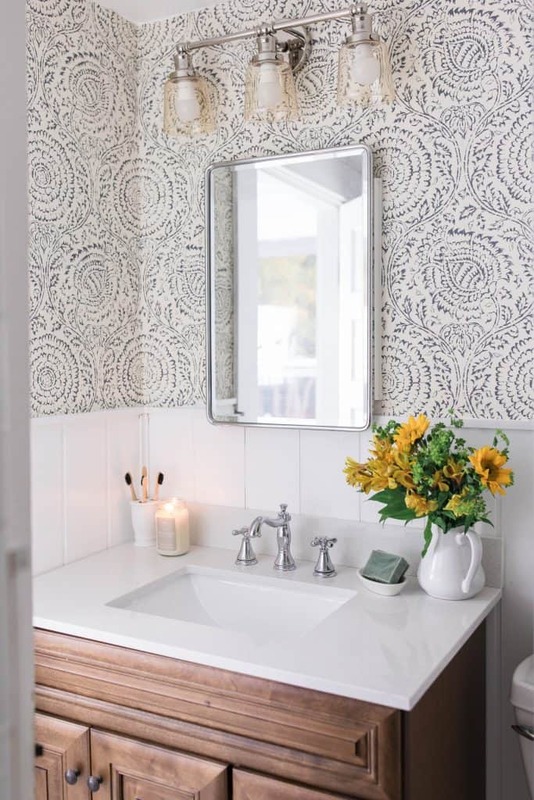 What is the name of the wallpaper and manufacturer? Would you please share where you found the lovely vanity. 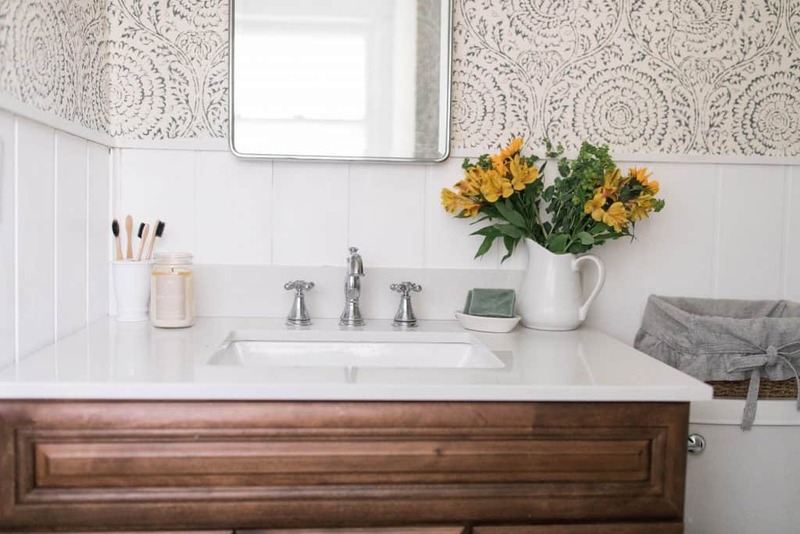 It reminds of the washstand from my grandmother that adorns our vestible. Just a lovely job you two did! Love this makeover! 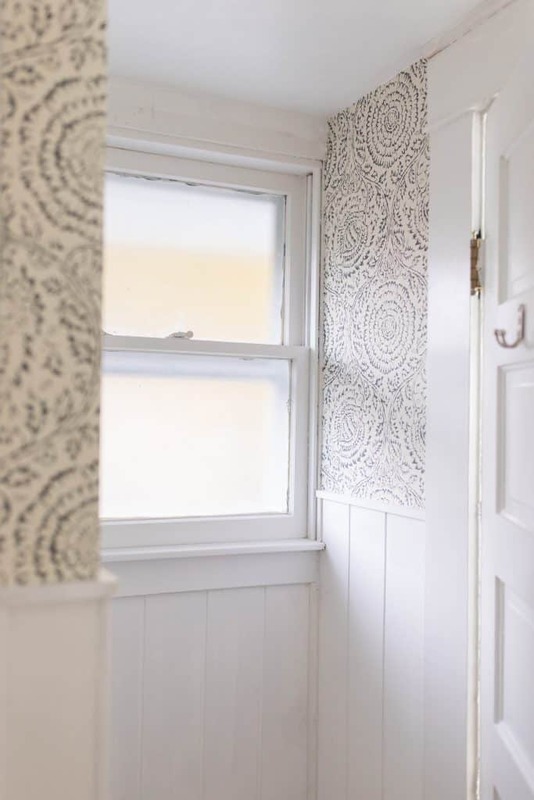 The wallpaper is gorgeous, as are all of your details. I cannot believe it is the same room. Beautiful job. I am sure you are so happy that it is finished, but so worth it. Also interested in wallpaper name and manufacturer – is that a grey blue color in the paper? Also interested in info on your medicine cabinet. Would you be willing to share? Beautiful space! I love how you combined the warm wood with gray. 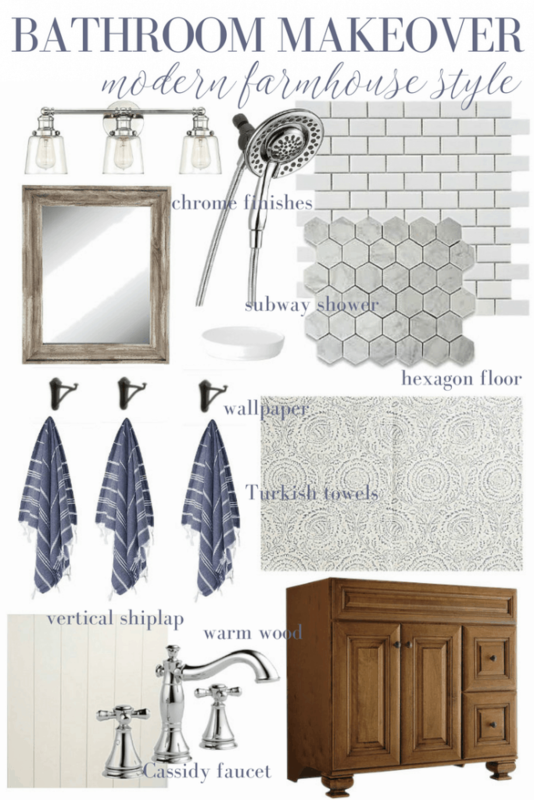 Those are elements in incorporating as we remodel our house. Thanks for the inspiration! New look is gorgeous, like the wallpaper. 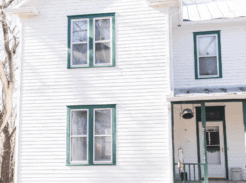 We are renovating an 1870 home for one year now. 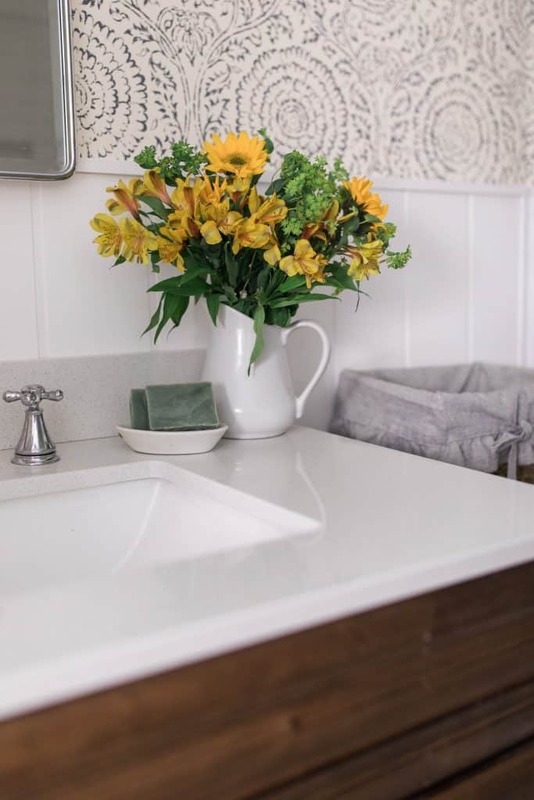 We added a bathroom bc one wasn’t enough and we have similar taste and interest and I chuckled when I saw we’d chosen the exact same vanity, and similar top lol.